Seriously though, love it! GITD and little lighty thingies all over a light just make it 10x better. Nice work! It was too bright for me. The blue LEDs seemed as bright as moonlight mode! I added a random resistor taken from an old driver to dim it down. This helped quite a bit. The random resistor I added to the aux LED circuit is wired to the aux LED board between the positive lead and the board. I’m thinking of moving this resistor to a more secure location on the driver between the negative lead and the ground pad on the 7135 chip. The aux LED board is currently wired directly to positive so is always on. I need to look at that walkthrough and figure out how to enable aux LED support in the driver so the driver can control the aux LEDs. 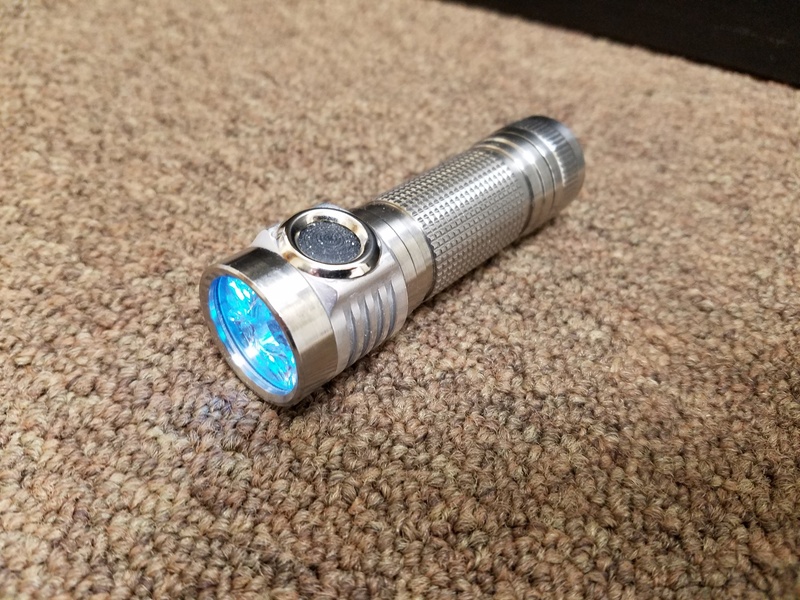 I’d like to try to make a lighted switch on this D4 with one or two LEDs. The plan is to drill a hole through a bare portion of the switch cavity for the LED switch wire. Inside the switch cavity I plan to mount an LED or two plus resistors. Not sure how well this will work. 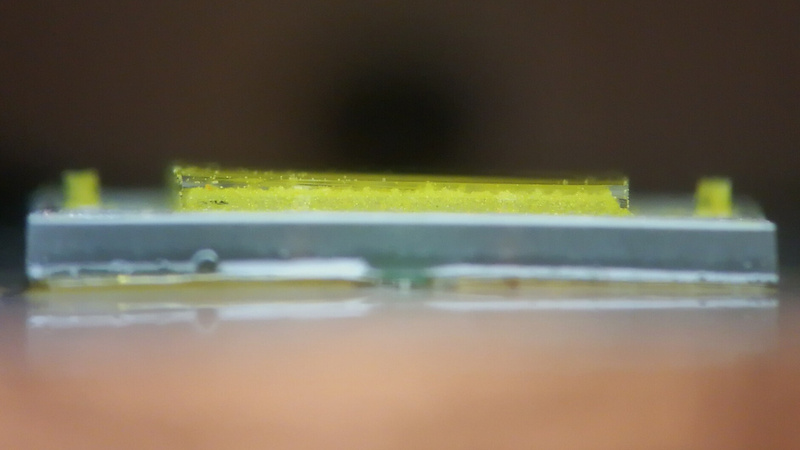 Possible complications include the resistors and LEDs being felt by the finger through the switch button, which might require dremeling a cavity for them. I plan to replace the black switch boot with a clear or white one so the switch light is visible. To make the new switch boot I plan to cut up a standard clicky switch boot. However, I do not know if this will be flexible enough. One concern is that I might not be able to sufficiently shape the new switch boot to provide the right tactile feel. Yeah that’s what I used for a lighted switch on the D4, two 1206 green LEDs & two resistors, quite a difficult job mucking about with trying to get the switch right. I actually used copper tape with the SMDs & wires soldered on and some 12mm acrylic tube to give a lighted ring effect, lot of trial & error there. Have you tried to make that switch “capacitive”, like measuring conductivity between “button” and body!? Thought about that method before and did a little experimentation but gave up when I couldn’t find suitable switches easily. I was looking at something like this 12V toutch switch for led strip, maybe it could be moded for 4,2V application? 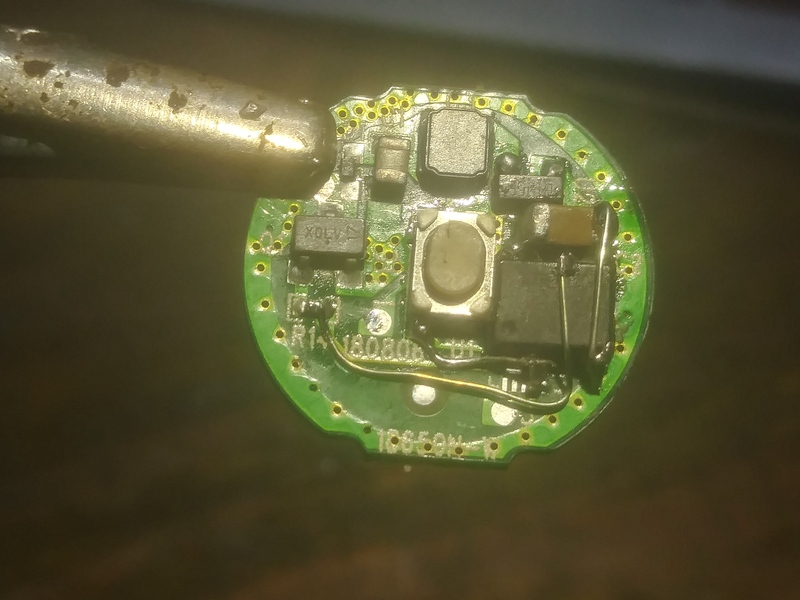 You got your 18650S working with an Attiny? Will it run Anduril? The t85 is a different beast than the 13a… The end goal is a direct replacement FET+1 running anduril! It would be AWESOME to have Anduril in a tailcap mounted driver that doesn’t need an extra electrical connection to the head. With such a driver, it wouldn’t be hard to mod any tailcap clicky light into an e-switch light with Anduril. when are you going to sell these Anduril tailcap drivers? I’ll take 10! Reminds me of the game Operation. 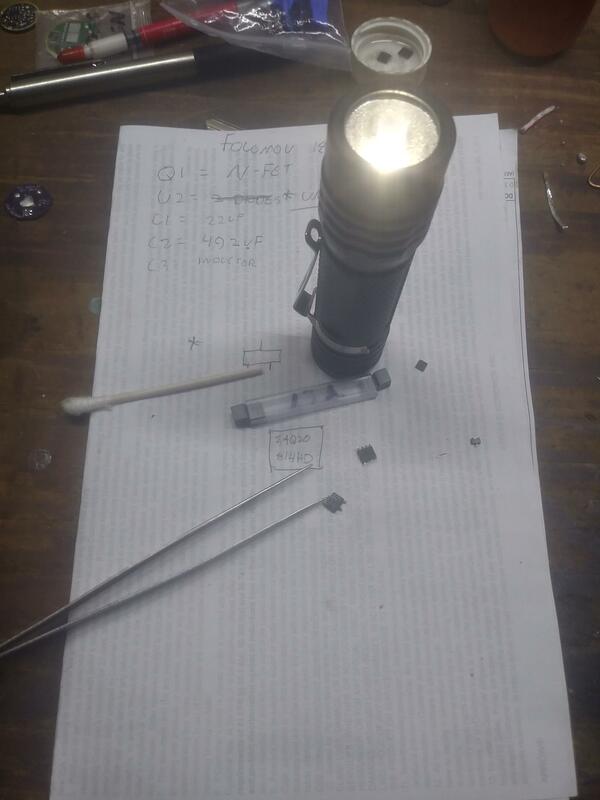 This flashlight is product of teamwork Tamagotchi and k_4. Carclo 10507, 3x XP-L Hi V2 3A, serial connection. It looks fantastic! 2.2 amps keeps it somewhat tame with the heat. What material is that? Looks to be an SS bezel, but the rest I'm not sure of. Probably laum or titanium because of the light weight? Hi Tom , it’s all aluminium, 2024 in classification on Europe and USA. Just it is polished … 22 Watts is turbo mode and it’s not long, because PI regulator control the overheat, it just about 30 sec , then power is slowly down and stabilizated on the thermal balanse. Where do I place my order for the group-buy? Trying to make a lighted switch for my D4. I bought a ton of tiny colored 0603 LEDs from Amazon ($14 for 360 in various colors). … but now I need resistors for them. QUESTION: What resistors should I buy? … preferably a link to suitable resistors from Amazon. Today I dedomed an XHP70.2 again that will fit in a resistor modded Thorfire S70S with an L6 SMO reflector. So when are you selling these LEDs? 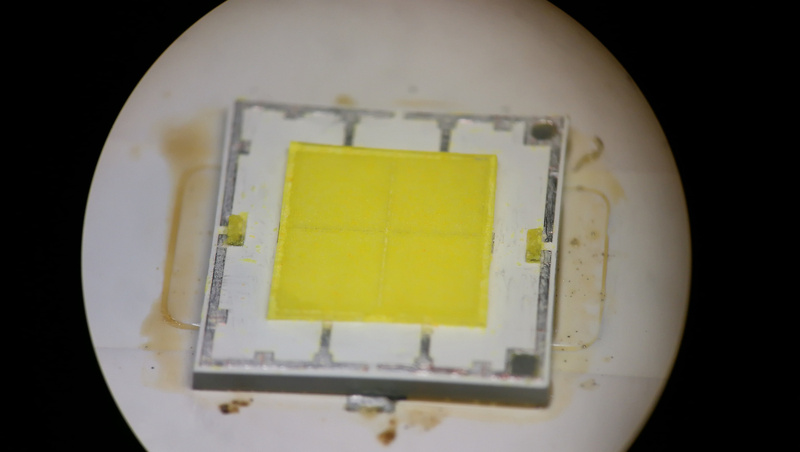 If there is a demand for it I can do it but each led is around 20-30 minutes to finish and shipping costs added all things almost triple the led price. I don’t think anybody will pay that much. If there is a significant demand I can make them. Did some simple work on a friends Q8, put 4 SST-40’s on a LED4Power quad board made for the Q8, swapped out the MOSFET for a 404, opened up the reflector aperture’s to fit over the entire substrate of the 40’s, replaced the springs with stacked Blue springs… the Q8 now has a nice defined hot spot and does 11,200+ lumens at start on new 30Q’s. Still a nice CW mod! 32,600 on my meter Tom, translates to 11,247 lumens. Brand new first time charged 30Q cells. Even if you take off 10% for margin of error, it’s still over 10,000… the numbers are what the numbers are, it’s bright as all get out and Rick will be tickled to death with it. Edit: Cool white? Not so’s you can tell…. 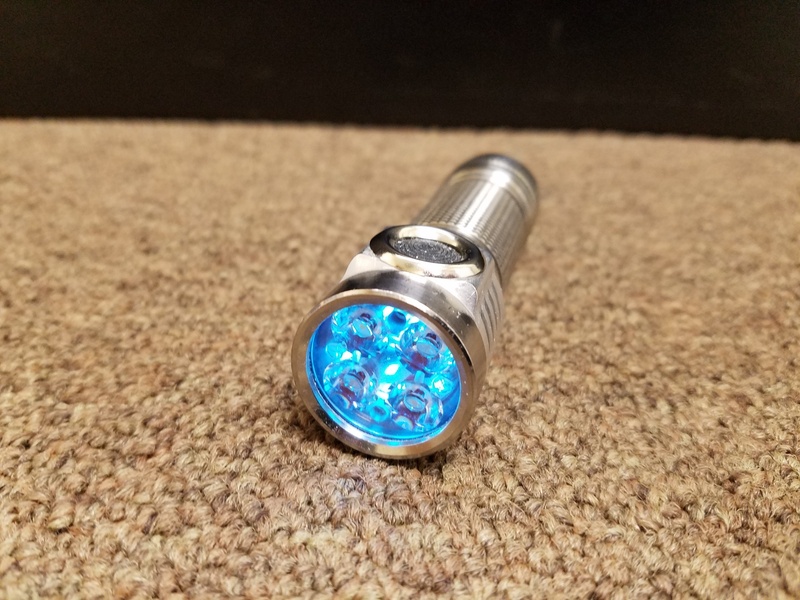 I got 12.5K lumens in a SupFire L1 (5 SST-40's) at turn on (manufacturer lumens), so I know it's close. And in a modded SP03 with 3 SST-40's I got 7480 lumens at turn on (manufacturer lumens) and 235 kcd, using VTC5D's (Vapcell). Checking my notes for the SP03, I realize I added in 26 AWG 3" wire to add resistance, not sure bout the springs. 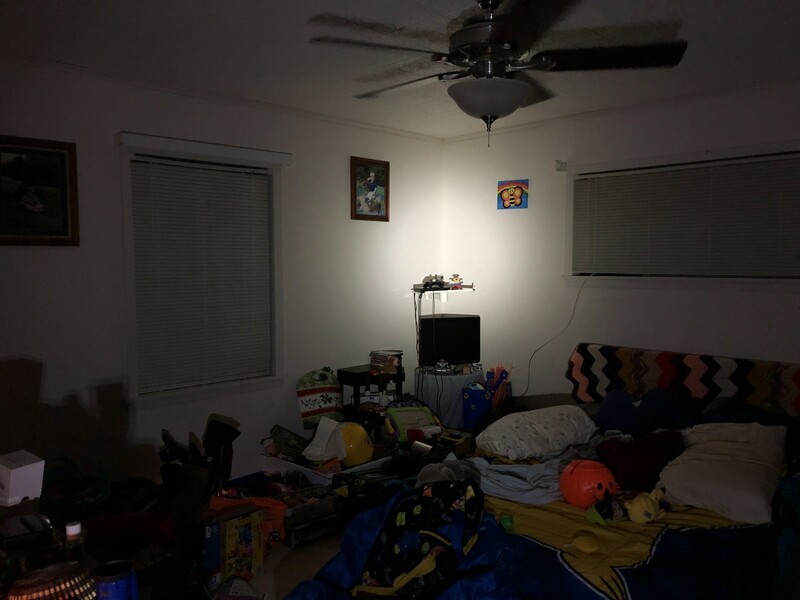 So, sure looks like 2800/LED is realistic for a fully tweaked setup.